I was invited to the menu preview of the 2017 Taste of Yaletown. Organized by the Yaletown BIA and similar to Dine Out Vancouver, participating restaurants in Yaletown are offering a $25, $35, or $45 menu until Oct 27. At the preview event, I got to sample the menus at two restaurants, one of which was House Special, serving Modern Vietnamese cuisine. House Special offers a 4-course menu for $45. The first course was Mekong Wonton. 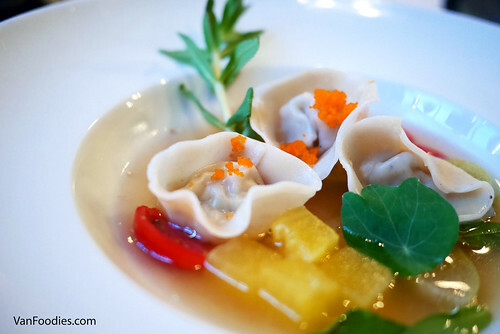 Shrimp and monkfish mousse wontons were sitting in a sweet, sour and spicy tamarind seafood broth, which was inspired by a traditional Vietnamese dish Canh Chua Ca. It’s different from other types of Asian sweet and sour, or hot and sour soup. I could taste the sweet and sour combo from the tamarind but I was definitely caught by surprise when the pineapple flavour hit my palate. Being so familiar with the Chinese style wonton soup, this Vietnamese version was almost refreshing to me. Spent a long weekend in Las Vegas with my girlfriends and checked out a few restaurants. Over the next few weeks, while continuing to write about local eats, I’ll be running some posts on this trip. Before we even got to Vegas, my friends had been convincing me to have Vietnamese food at Treasure Island, where we called home for the duration of our trip. Frankly I was hesitant – Vietnamese in Vegas, really? Once we checked in at our hotel, we walked around to look for an alternative so I didn’t have to eat Vietnamese. I was out of luck. Other restaurants either didn’t seem all that interesting, or they were serving something I didn’t feel like at the time. Alright, Vietnamese it is. The restaurant is actually attached to the Coffee Shop of the Treasure Island, which offers a different menu – a Western menu with sandwiches and mains like fish & chips and steak. However, you cannot order from both menus. Once you selected to eat in the Pho section, you can only order from the Pho menu. Within this menu it not only has Vietnamese dishes, but also a few Chinese style stir-fries. Just to be safe, I ordered the basic Cooked Beef with Rice Noodle Soup. This normally costs you around $7 in Vancouver – this cost me US$12.25. After all, it’s Las Vegas. Towards the tail-end of 2011, we’ve been blessed with a few more dinner invitations, including another from VANEATS.ca. This time we checked out KIN Resto Bar on Robson Street, and its KINDLE WITH KIN! package, a 6-course dinner for two. KIN took over Chau Kitchen’s location and continues to serve up modern Vietnamese dishes. I never dined at Chau so I can’t compare. KIN’s menu looks quite straightforward, with only several choices each of appies, share plates, entrees and desserts. You don’t need to offer too many dishes as long as all of the offerings are good. Let’s find out here. Before we start, please keep in mind that this is a special package so the following dishes are not necessarily available on its regular menu, and even so, the portion size may be different from what you see here. This should serve as an indication of the food quality at this restaurant. While we were waiting for the first course to arrive, I ordered myself a Lychee Mojito as it’s Mojito Monday for $6. It’s a pretty big glass of mojito, very minty with subtle note of lychee in the background. First course arrived, and it’s the Prawn & Thai Basil Rice Paper Roll. It looked just like the regular salad roll you would order at a Vietnamese restaurant. The twist is that they put some crispy spring roll wrap inside, which added another layer of flavour and texture to the ordinary roll. Overall the roll is light and refreshing and quite fragrant thanks to the thai basil. On the regular menu, they serve 5 types of rice paper rolls and you can choose from 4 different types of dipping sauce. We got the standard prawn one with peanut sauce. The mango & cod was intriguing but our tummies ran out of room to give it a try. There’s certainly no shortage of Vietnamese restaurants in Vancouver, with the majority of them offering mostly Pho on the menu. As delicious as I think pho is, it’s nice to change things up a bit from time to time. Located on Main and King Edward, but originally from a location on Cambie St. (which explains the name), Cambie Vietnamese Restaurant offers a wide menu selection that expands far beyond the typical varieties of pho. The dining space is fairly large with a number of tables and booths, and those who know me know how much I love booths. The inside is recently renovated, looking clean and fresh. We were only there for a quick dinner, so we only ordered two dishes. 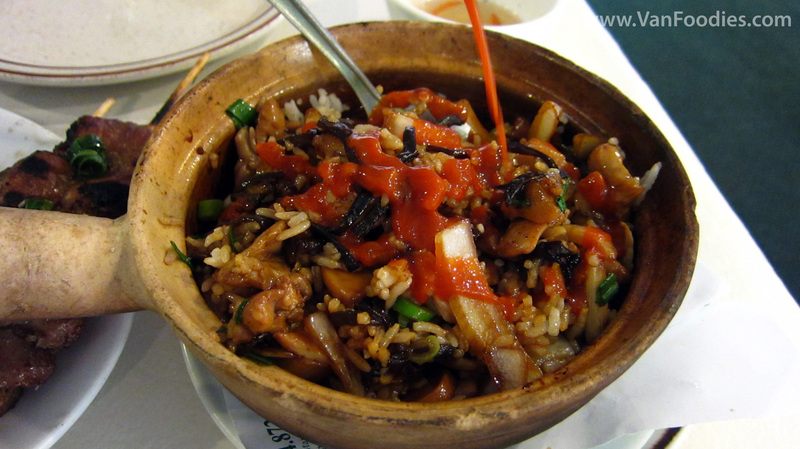 We had the Hot Pot Chicken Rice Pilaf, which can be described as a Vietnamese style Bibimbap. A mixed rice dish is one of my childhood favourites. I just can’t say no to any variety of that, especially one that comes in a hot clay pot. Mixing all the ingredients together, adding my own hot sauce is all part of the fun. The end result was pretty good. The chicken mushroom stir fry was saucy, and so a perfect match for the rice. One of the best things about travelling is the food. You get to eat out every meal and you can rationalize it. And what do you know, while staying in Seattle this past month, I got hungry and had to eat. It’s always a good idea for you to chat up the front desk staff when you are looking to feed yourself, since it’s likely they would know their own city better than you, the tourist. We were lucky to have Ryan—an easy going fella with a slight southern draw. He made a few suggestions for us, here’s the first of the two. After a raving review from Ryan, we decided to grab a little lunch from a Pho joint (FYI it’s pronounced “fuh”; are you happy now Frank? Are you?) down the street, called Pho Viet Anh. This place definitely stands apart from the typical pho places around Lower Mainland. Inside, the restaurant is dim and cozy. The windows are mostly covered with bamboo sticks, the walls are painted in a brick-red colour, and the décor is very much Asian, though I can’t speak to its authenticity. Moving onto the menu, there is a choice of four distinctive types of broth: traditional beef, hot ’n spicy beef, chicken, and vegetable. In addition to beef, there are also chicken and veggie options as well. I’m a huge sucker for choices so this is definitely a plus for me. However, there are less beef options, with the menu missing the essential (to me anyways) beef tendon. After some thought, I chose the hot ’n spicy beef broth with brisket and fatty flank. I could be imagining this, but the broth tasted that much better pre-spiced than if I had added in the hot sauce myself. The large bowl I ordered is well deserving of the label large, with a very generous portion of meat piled on top. The brisket was tender and done just right. The fatty flank was… well, very fatty, and unless that’s your kind of thing, you are probably not going to enjoy it. Being the manly man that I am, I savored every bit of the fatty meat.